^ Okay, this picture is so cute it warms my heart. Well, the cold, shriveled and blackened prune where my heart should probably be. 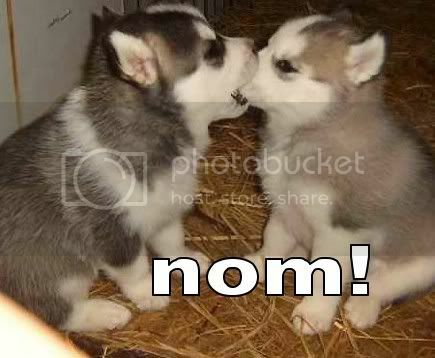 "Nom" is one of those little phrases that rears its unoriginal head all over the internet, primarily in the context of cutesy animals eating food. Adorable. Or at least, it used to be before the entire internet decided they would use the phrase more often than the word "like" punctuates their meaningless statements. "Nom" and its variants are kind of onomatopoeic in the context of animals, so I'll let it slide there. I'd even let it slide in the case of Pac-Man, because it makes a bit more sense than"WAKKA WAKKA WAKKA". But when real people start using it to denote their eating activity, usually in the context of declarations as obnoxious as "PIZZA?! OM NOM NOM", it ceases to be endearing. Instead it becomes an annoyingly turgid and unflattering phrase. Ultimately, you are not a cute, lovable animal. Indeed, you are neither a "lolcat" or some other internet meme. You are a grown human with no concept of reality who needs to be taken to the vet to be put down. Labels: buy me a hammock, the internet is an abyss where originality is repeated ad nauseum until it ceases to provide amusement, this blog could be summarised with "i need to stop using the internet"